Gerald Cleaver, Craig Taborn, and Thomas Morgan. Photo by John Rogers, courtesy of ECM. There’s nothing new under the sun, and most musicians are working within some kind of tradition. Still, there’s always an urge to hear that tradition extended and transformed. 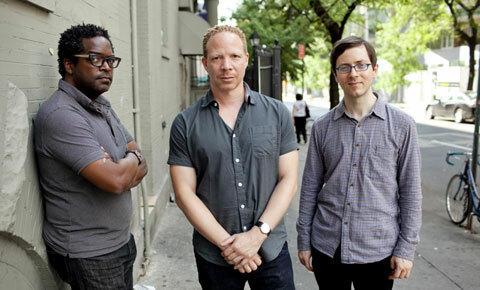 At the Regattabar Wednesday night, the Craig Taborn Trio, although clearly working within the jazz tradition, essentially created their own language. Pianist Taborn, now 43, has been has been a “one-to-watch” since first recording with James Carter’s quartet in the early ’90s, someone who could play inside or “out,” with great chops and a broad sense of jazz vocabulary, from bebop to Cecil Taylor. During the 2000s, he had a lot of visibility playing Fender Rhodes with Dave Douglas’s band, Chris Potter’s Underground, Tim Berne, and David Torn. He was also releasing his own recordings as a leader and playing with everyone from Roscoe Mitchell to Bill Laswell and Mat Maneri. But in 2011 he released a solo acoustic piano album, Avenging Angel, and then, in 2012, a trio record, Chants, both on ECM. The first was like a series of etudes, intense formal exercises, but full of expression and dramatic dynamic constrasts. Some tracks, like “Glossolalia,” wouldn’t have been out of place on a classical program. At the Regattabar, Taborn introduced the band, and then they played for a solid hour, with only three brief pauses and no further commentary. They began with a spare, softly played repeated piano figure in a hazy harmony with a low rumbling pulse from Cleaver, very dry, with snares off, light cymbal strokes, and isolated notes from Morgan’s bass. At first, Taborn played so softly that I worried that at some point we wouldn’t be able to hear him over the drums. Gradually the piano figures unfolded into insistent repeated tremolos in the left hand and more free dulcimer patterns in the right. The incremental shifs in the music suggested one of Morton Feldman’s meditations, and soon the volume and number of notes had increased. Cleaver’s steady rumble picked up. At about the 10-minute mark there was a shift to a near-swing dotted rhythm in Cleaver’s cymbals, but still with that arrhythmic rumbling pulse underneath. Soon, the left-hand repetition — joined by the throb of Morgan’s bass with Cleaver’s tom-tom — created an exquisite tension that was miles from the impressionistic dreamland of the opening few minutes. How had we arrived here? Taborn played longer lines, approaching the extended right-hand lines of jazz piano, but pungent, with plenty of dissonance between right hand and left. He began to spell out chord progressions, unison lines between left hand and bass, and then a final fortissimo cadence by the band. The audience exploded. The band had been playing for about 20 minutes, something that was essentially one extended piece. This was not one “tune,” with long solos, but a carefully calibrated group effort. In fact, you couldn’t easily identify any portion of the piece as a solo. The night went on like that. Two more pieces completed the hour, then a 10-minute encore. One driving vamp suggested a slightly askew Cuban son-montuno. A twisty solo piano introduction hinted at Monk and early Cecil Taylor, as if about to become a jazz standard before the harmony became unmoored. And always there was the astonishing independence of Taborn’s hands — at times hammering out one of those impossible fast, odd-meter repetitions in the left hand while the right marched in slow, stately chords against the fury of Cleaver’s drums, Morgan’s bass pivoting between the two. And in one passage, Taborn took off in furious parallel runs in both hands. Jazz fans often talk abut the “telepathic” communication taking place in bands, but the formal integrity the Taborn trio achieves in the balance between written material and improvisation is special. Morgan has a beautiful touch, sometimes nearly as soft as Taborn’s quietest passages, and in the beginning of that encore they all seemed to be playing as quietly as they could. There were extended passages where Taborn and Morgan played in pure counterpoint — extended lines, completely independent, but also in sync. In the encore, Taborn fell into one of his odd-meter left-hand repetitions (a pianist friend counted one passage as being in 11, “unheard of”), while his right hand shouted freely with big exultant chords. A kind of call-and-response. He smiled and nodded at his bandmates, and everyone fell into a slamming unison figure and — bang — it was over. I never saw the original Bill Evans trio — in fact, I never saw a lot of things — but I did see this. This entry was posted in Live review and tagged Craig Taborn, ECM, Gerald Cleaver, jazz, Morton Feldman, Regattabar, Thomas Morgan on May 9, 2013 by jongarelick.